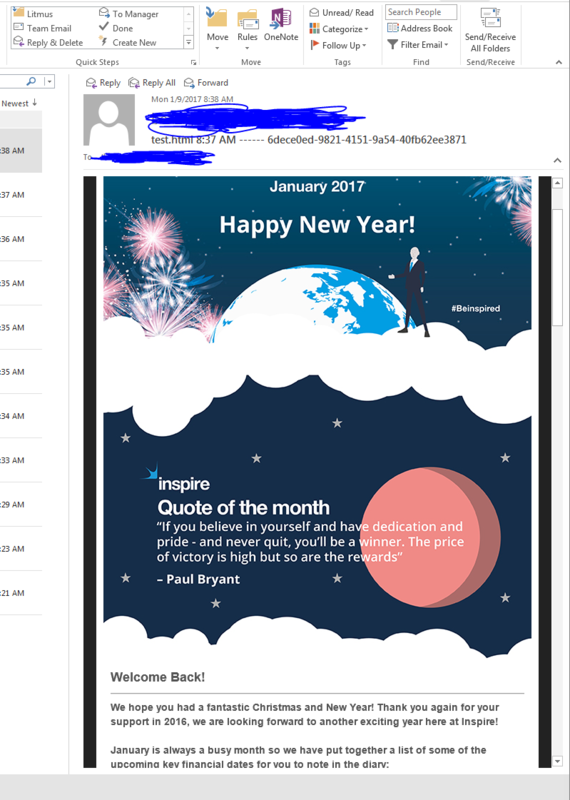 I have an email template which Outlook is adding additional spacing to on the right hand side causing the template to break entirely. Any ideas on a fix? <td style="padding: 0px 20px; font-family: 'Open Sans', Arial, sans-serif; font-size: 14px; mso-height-rule: exactly; line-height: 20px; color: #555555;"><strong>Warren appointed to Board of DCCI</strong><br><br>Inspire are proud to announce its founder and Managing Director Warren Munson, has been officially appointed to the Dorset Chamber of Commerce and Industry board of directors.<br><br>Warren joins the 12 strong board members as a non executive director and will be collectively responsible for the success of the organisation, helping to drive it forward in support of its 800 members which together employ more than 37,000 people in Dorset.<br><br><strong>DCCI chief executive Ian Girling said:</strong> “Warren brings with him vast experience and expertise and we are delighted to welcome him to the board. His appointment represents another milestone for DCCI as we continue to expand and help businesses to drive the local economy whilst also giving Dorset an ever more powerful and influential voice at a higher level.”<br><br><strong>Warren’s comment:</strong> ‘It was an honour to be asked by Ian Girling  Chief Executive of DCCI, to become a Non-Executive Director for the DCCI. The DCCI is a great organisation that does a fantastic job of supporting and representing businesses in Dorset. I am extremely keen while fulfilling this role to support the executive and management team at DCCI but also ensure that the entrepreneurial and owner managed businesses in Dorset and supported for all they do and contribute to the Dorset Economy. Kindly used below source code. Thank you so so much! You are a lifesaver. What was the issue so that I know for the future? Your template size is 600px. But the two column section width 620px behalf of 600px, therefore, it's appears 20px extra space in right side. Sorry, had to remove some personal info. You probably have something that's too large to fit in a width of 600 (px) somewhere else in your email. But, I couldn't find it.